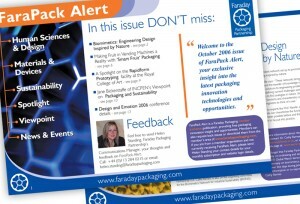 Bright, colourful and fresh newsletter design goes down a storm in the scientific and packaging sectors. This monthly alert goes out to all subscribers who wish to be kept up to date on all the latest news in the scientific design community. Highly informative, yet a little bit quirky in style, this newsletter design shows that science is not boring! This is exactly the point that our client wanted to get across. And our designers certainly came up with an interesting and highly readable newsletter which ticks all the boxes from a design perspective.